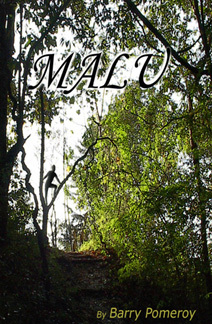 A cave girl trapped in modern times, Malu has lived a peaceful existence in the forest of Flores, Indonesia. When Hantus capture her, they little realize that the existence of a living Homo Erectus in the modern world will disrupt forever the lives of dozens of people. Even those who gape into her cage turn away from the intensity of her green eyes and constantly moving hands. While Malu is transported to a lab in Massachusetts by avaricious researchers who hope to sell her DNA, a photographer flees for his life from a man he doesn't know, and a murderer sells cocaine and dreams of revenge. Like the flap of a butterfly's wing, Malu causes two eminent scientists to become her temporary guardians, a reluctant activist to plan his first animal rights action, and a criminal offence to be righted. Such is the tableau that makes up Malu, the story of an impossible girl whose relentless drive to be free forces a reluctant world to afford her a home.